Relational Ethics in Practice presents a new collection of narratives on ethics in day-to-day therapeutic practice. Highly experienced professionals from a range of roles in the therapeutic professions explore ways of developing ethical and effective relationships. The contributors provide the reader with engaging and informative narratives that indicate how ethics can inform and influence practice in a variety of clinical contexts across the helping professions. These personal and professional narratives will encourage people to think more proactively about ethics and the impact that they have on both therapeutic practice, and life in general. how theoretical approaches can inform ethical decision making and practicepractical difficulties and ethical challengesinnovative and unconventional approachesinformed consent across various contextspointers for good practicethe notion of the 'wounded healer'. 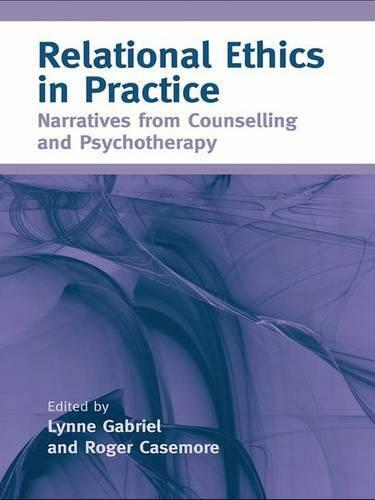 Relational Ethics in Practice: Narratives from Counselling and Psychotherapy will appeal to a wide range of readers involved in the helping professions including counsellors, psychotherapists, researchers, supervisors and trainees.